The reason that the timing constraints of the new contactless card standard are much less precise than our prototype is that the new contactless cards’ distance bounding exchange uses the same (relatively slow) communication protocol as the rest of the transaction. In our design, the distance bounding exchange uses a special high-speed mode. Also, the new contactless cards send a single 32-bit challenge and expect a 32-bit response, whereas in our prototype there is a repeated single-bit challenge and single-bit response (based on a protocol by Hancke and Kuhn). For both of these reasons, in our prototype, compared to the new contactless cards, each challenge-response exchange is far more rapid and hence the timing can be much more precise. Clearly this doesn’t offer the same guarantees as our design, but it would still represent a substantial obstacle to criminals. While it’s enough time for the radio signal to travel far, it’s still a very short window for the software to process the transaction. When we demonstrated the relay attack it regularly introduced delays of hundreds or even thousands of milliseconds. A relay attack against contactless cards using off-the-shelf components would be similar. An edited version of this article was originally published on The Conversation, written by Steven J. Murdoch, UCL. Hey Steven, just wanted to let you know that we wrote an Android app for NFC relay attacks that’ll run on a modern smartphone (e.g. Nexus 5) and will also fake the UID of the card, and we made it open source. See https://github.com/nfcgate/nfcgate for details. Maybe it’ll be helpful for you or someone else reading the article. Also, I’m glad to see that this hole is being closed now, albeit slowly. Some systems we tested are vulnerable and will not be getting fixes :(. Thanks for your comment. It is good to confirm that indeed the software needed is out there. Did you measure the delay introduced by your software? I would be curious to know how much this is in reality. We did a brief measurement, and ended up with 65 +-38 ms of delay in a local WiFi (See the extended abstract and poster linked in the GitHub Readme). That is mostly due to the fact that we have a client-server infrastructure (Reader Android 1 Server Android 2 Card), which is not very optimized. You could probably lower that latency with direct connections and more efficient code, but obviously not below practical distance bounding limits – it’s a proof of concept and not designed to bypass distance bounding. There is also a second mitigation strategy banks and shops use – the contactless payment is restricted to something like 20 EUR and you can do only 3 or so in a row. After that the terminal will refuse the transaction and demand a normal payment using chip & pin instead. So while this doesn’t prevent the attack, it significantly limits the possible impact – in this case to max 60 EUR. Still nasty, but nowhere close to the much higher limits when a regular chip & pin transaction is done. Indeed, transaction limits still apply. In the UK this is £30 per transaction (and there can be a request to enter a PIN periodically, but this has never happened to me). This mitigates the risk, though there is also the possibility that the limits could be bypassed. Al this is considering that the payment terminal has been opened without activating the tampering detection which can be done an old terminal as on the video but quite impossible on recently PCI certified device. The devices when opened are erasing the encrypted key which are allowing them to communicate with the bank. they become useless, especially for the demonstration described in this article. Nowadays the terminals are well secured but I agree that there are multiple skimmer integration attempts , especially on ATMs with fake keyboard or plates, including cameras, all for capturing the PIN and then it is not the responsibility of the cardholder, I think , if the PIN is stolen.. No we have the PIN on Glass coming soon , which will authorized the PIN to be entered on any phone who’s able to read a contactless credit card and process the transaction, I am becoming really concerned .. especially that a Phone is fully accessible anytime to hackers ( a payment terminal is not by the way) .. The relay attack doesn’t require evading the tamper-resistance measures because the terminal that the victim interacts with never communicates with the bank. 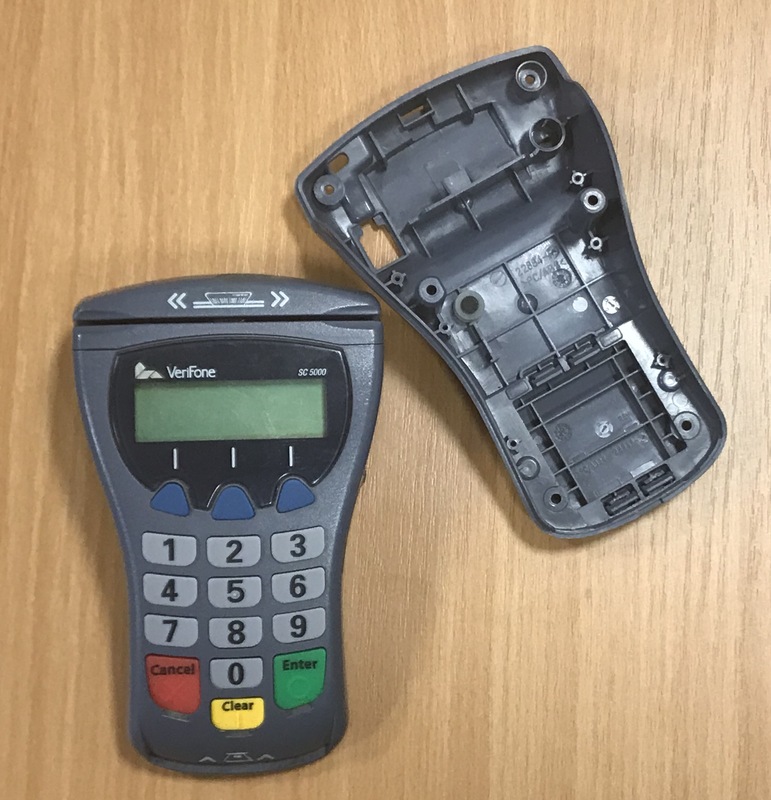 The modified terminal is there to trick the customer into presenting their card (and potentially PIN) so only has to look plausible – the electronics inside can be replaced entirely. 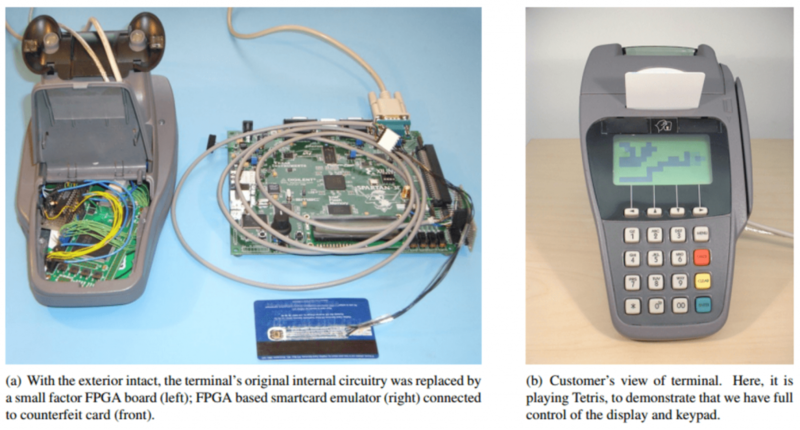 PCI security standards only requires that tampering be detectable by the bank, not the customer. For example, here’s a Verifone SC5000 terminal that we’ve been experimenting with. It’s PCI certified but we were easily able to open it and remove the internals. It has a standard display module which we could connect to replacement electronics. With the addition of a NFC antenna and contactless payment sticker, I’m confident customers would use it without hesitation. The question of customer liability is a different issue. The approach of the UK banks has been that if a PIN is used for a transaction then the customer must have been negligent and hence liable for the fraud. It would be for the customer to show that the PIN was obtained through skimming, which is extremely difficult. We need changes to regulation to reverse this unfair situation. It will indeed be interesting to see what will happen with the relaxing of PCI standards to allow PIN-on-glass. Provided that there is robust regulation that ensures risks are not systemic and that customers don’t pay the cost of fraud, I would welcome careful experimentation in this area. I notice that Mastercard have taken measures to address this with the “Relay Resistance Protocol” in M/Chip Advance.